Our series of interviews with team members continues with our writer/designer, Robin D. Laws. 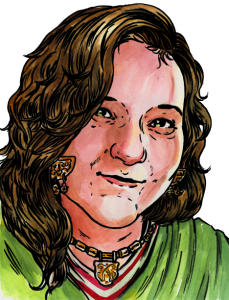 I am a tabletop roleplaying game designer and author. I created such roleplaying games as Hillfolk, Feng Shui, The Esoterrorists, and the upcoming Yellow King Roleplaying Game. My fiction credits include nine novels and the short story collection New Tales of the Yellow Sign. I’m the winner of five Gold and five Silver ENnie Awards as well as the coveted Diana Jones Award. You can hear me every week on the podcast Ken and Robin Talk About Stuff. Through the fanzine Alarums and Excursions (which will feature later in our story) I struck up a correspondence with Jonathan Tweet, eventually leading to my contributing additional material to his groundbreaking game Over the Edge. He says I inspired this by imagining what a William S. Burroughs roleplaying game might look like. At about the same time I got a query out of the blue from Steve Jackson Games, asking if I wanted to turn the weird hunter-gatherer dark fantasy game into a supplement; it became GURPS Fantasy II. That led to additional opportunities and I’ve been working full time as a writer and game designer since 1992. In other words, I got in when the cutting edge communications technologies were APAs and physical mail. Six Ages: Ride Like the Wind is about a people escaping from encroaching glaciers, but I owe my participation in it to the actions of ice demons. 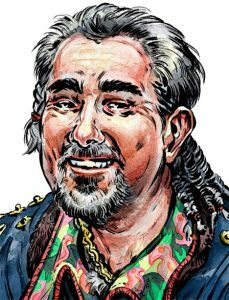 In 1997 I went to a Glorantha convention in Chicago, planning to meet with the world’s creator, to pitch him on my approach to a new roleplaying game for his setting. A massive snow storm canceled his trip, and here I was at a convention with the meeting they’d flown me in for also out the window. We both looked at each other and thought “oh wait a minute” and before I knew I was signed on as head writer for KoDP. Not far into the process it became apparent that writing was also game design work, hence the double credit. The simulation of the classic analog Addams Family pinball game, on the Pinball Arcade iOS app. How did your writing style develop? Any writer’s voice is a combination of all the various influences you absorb through reading, plus the effort of writing a whole bunch of terrible stuff until the cruft falls away. The secret to developing a unique style is to assimilate so many disparate influences that they, plus your life experience and personality, come together into something no one else would arrive at. I’m not saying the game has a big culminating storyline. But if it did, getting the scene branching right for its myriad possible outcomes took a lot of doing and redoing. Hypothetically. Day to day, the biggest scene writing challenge lay in the tri-cultural nature of the setting this time out. 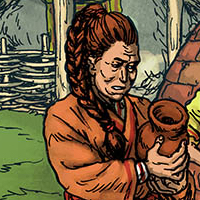 In KoDP, you’re Orlanthi clan folk, interacting with other Orlanthi. 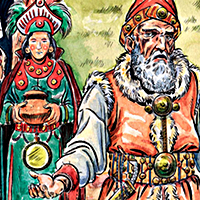 In this opening chapter of Six Ages, any neighboring tribe you deal with might belong to your own culture, a closely related rival culture, or a third, quite distinct people. So any scene where you talk to a neighbor required a distinct set of responses for every approach you take. Several testers reported finding certain moments genuinely affecting, even moving. That’s the response you hope for as a writer in any medium. Maybe surprising in a resource management game, which you might not think of as a forum for powerful emotion. That’s a testament to David’s original genre-fusing vision for KoDP. It also reflects our shared attitude that, even though the game is set in an imaginary place, that it should have room to reflect the full contradictions of the human experience. With so many scenes to work with I could build in a wide emotional palette, from funny to scary to—depending on the choices the player makes—triumphant or tragic. Our series of interviews with team members continues with our lead artist, Jan Pospíšil. I have a master’s degree in computer graphics programming, but in art I’m self-taught. I’ve been full-time freelancing for over 5 years now (I think). At first I posted my portfolio on a bunch of RPG forums and that got me a few hobbyist level jobs in pen and paper RPGs (which is where I would get the majority of work in the following years). Then in short succession Jeff Richard (then of Moon Design, now Chaosium) and Jon Hodgson (Cubicle 7) contacted me for work and I’ve been drawing for them ever since. I have to admit I don’t remember. Unfortunately I lost a backup drive from that time, so there’s no way to check. Most likely it was a few pieces of black and white art for a supplement book by a small publisher. The first product I consider a career changer was probably the Guide to Glorantha, for which I painted a series of colour plates. Someone shared a few pictures from their game in a screenshot thread on the TaleWorlds forums. I was immediately interested, because I’ve never seen a game with art like that. Especially intriguing was a scene depicting Grazelanders, who I recognized as Scythian/Pazyryk inspired. How did your art style develop? Chaotically and slowly. Before I started learning with some semblance of focus (in uni and on), I did everything by feeling and instinct. In a way that felt more free and I was far more daring in those days. I did a lot of ink drawing on Six Ages (as opposed to painting), which was very useful training in hindsight. I also practiced horses a lot, that’s always useful. The scope of it. Most projects in the past would take up to a few months to finish, followed by a period of crippling doubt (“Is any of this any good? !”), followed by the joy of seeing them in the hands of happy customers. Working on Six Ages meant four years of not being able to talk about anything I was doing, and there was so much of it to do! Definitely a different experience. Seeing it all come together and working with the other members. Reading Robin’s writing where he’d build on the concepts we came up with in preproduction, meeting the characters he created. 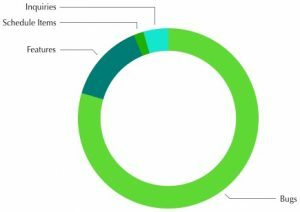 Reading the testers’ experiences playing the game for the first time. I’ve spent the most time with Mount&Blade:Warband (thousands of hours probably, since 2006). The best recent game I played is The Witcher 3:Wild Hunt (I’ve been a fan of the Witcher books since childhood). My “most interesting/innovative” recent game is Exanima – for its unusual physics-based combat system (having 238 hours played on Steam). Although I (David) get to be the public face of the game, nearly two dozen people helped me make it. I’d like to share some of their stories, starting with our Quality Assurance (QA) Lead, Liana Kerr. I dabble in writing and art, and I’ve studied Japanese for several years. I’ve done fan translations of video games and a little professional translation. I have a huge weakness for RPGs, adventure games and sim games, but I have a tendency to lose myself in games, so these days I just play a couple of mobile games that don’t require much time or brainpower. I’m the primary caregiver to my two children, six-year old Milo and one-year old Felix. I had been following the King of Dragon Pass blog, and I offered to help beta test the iOS version. “I have a good eye for detail,” I told David, in what may have been an understatement. Unfortunately, David already had as many beta testers as he needed. Fortunately, most people are not very good beta testers. I got in on the next round of testing, and as I hadn’t played KoDP for several years I was thrilled to be able to return to the game. Beta-testing KoDP coincided with being pregnant with my older son, and it distracted me from my constant nausea. I ended up filing so many bugs that I was convinced David was sick of this annoying fangirl who kept nitpicking his game! But instead he asked me to help test the iPad version, and sent me an iPad inscribed with “Queen of Dragon Pass.” When he started adding more new content to KoDP, I started working as a freelancer doing more formal QA, and it’s been my dream job ever since! King of Dragon Pass is the first game I ever worked on professionally. I’ve also worked on fan translations of some Super Famicom RPGs, both as a translator and finding bugs in the patches. (I translated Metal Max Returns several years ago, and three games that haven’t been released yet, Granhistoria, Metal Max 2 and Tenshi no Uta.) Working on Six Ages has made me want to design games myself. Maybe once the kids are older! 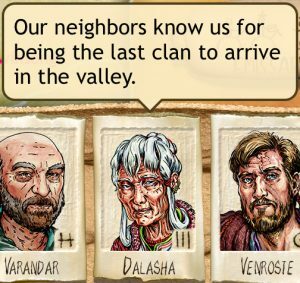 So there are a lot of little details in Six Ages that come directly from my experience as a KoDP player and give you a greater sense of connection to your clan. I always wanted my clan to be known for something, as the other clans are, and in Six Ages your actions will give you a reputation. I wanted a little more focus on some of the recurring characters, and now they give unique advice and have a couple more scenes… although if you want them to be heroes, you have to give them those opportunities yourself. Having my ideas get implemented and my input valued went a long ways towards boosting my confidence, which in turn made me more likely to give my opinion even more freely. I think Six Ages is even better than King of Dragon Pass, and even though I have seen all possible outcomes of every scene in the game, I still enjoy playtesting it. I’m proud to say that some of that depth came from my input, and hope that other KoDP fans love Six Ages as much as I do! I got to be there as it all came together. 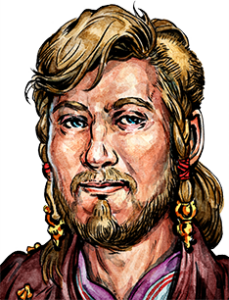 When I started working on Six Ages, Robin had written over a hundred scenes, but the artwork was all placeholders, there was no music, the UI was incomplete and the advisors’s faces were from KoDP. Plus, there were still hundreds of scenes to be coded, and some weren’t written until well into the game’s development. I worked assiduously on testing scenes, but I couldn’t really visualize the eventual outcome. But with every new build of the game, there was some small improvement: for example, the pixelated placeholder art would turn into a pencil sketch with notes on it, which later became a black and white drawing, which eventually blossomed with glorious color. I tested most of the exploration scenes with placeholder art or sketches, so it was gratifying to run into the finished scenes as I played and experience them as they were meant to be seen. When the music was added, Six Ages really started to feel like a game to me, not just a collection of scenes and sliders. By the time I was able to finish the game for the first time, I felt like we had really created something special! I also just love finding really great bugs. One of my favorites was the bug where another clan would show up to attack you, then parley with you and offer you tribute to end the attack. Compared with game-breaking bugs or bugs that are hard to reproduce, a bug where people show up on your doorstep and offer to give you loot instead of attack you is a sweet bug indeed. It was almost a shame to report it! Any time negative numbers of warriors die, fractions of a cow get traded away, or nonexistent clans show up at my clan borders, my day just gets better and better. What I love best is when I manage to crash the game so badly that I can’t even re-open my saved game. Because that means we can fix it, and no one else will ever lose their game to that same bug. I get territorial about my bugs; once Six Ages is out, no doubt thousands of people playing it will expose some that I didn’t find, and some part of me is always going to feel jealous of the people who find the best bugs. 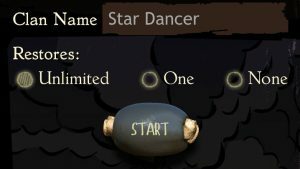 My desire to play with some form of moral weight actually inspired one new option for the game. You can still choose to have unlimited restores, which means if something goes wrong you can restart the year with no penalty. But you can also now choose to give yourself just one chance to restore, or you can play the entire game with no ability to restore at all. When you can only turn back time once, or when death is permanent, the impact of every choice you make is magnified. I have beaten the game on Hard mode with no option to restore (without resorting to the debug menu, of course). So it is possible, but it requires patience, diplomacy, careful preparation and the ability to roll with the punches. 123 Inquiries. This includes playtester feedback and comments, and 75 completed games. I try to do some analysis of each game, to learn where players get stuck and to make sure things are tuned OK. Once in a while this uncovers bugs. 485 Features and 61 Schedule Items. These represent tasks like like “Map Creation,” “iPhone X support” or “Sweep to be sure ChooseLeader is followed by a leader test.” The two categories are pretty similar, but a Feature would probably be passed to QA to check, and a Schedule Item could usually just be marked completed. 2714 Bugs. These are things that didn’t behave as expected. They’re typically fixed, then verified by QA as working correctly. Since we added playtesters over time, we tended not to get a lot of duplicate bugs (though it’s never a problem if we do, since a different report may give insight into reproducibility, and they’re easy to verify). Overall, we closed 3313 of the 3412 cases. Of the 99 cases not closed, 26 are feedback that I was keeping handy (and probably should close to clean up the project). Most of the rest are issues that we deferred as part of the triage process, (see part 1) or as features that would be nice to have in an update. 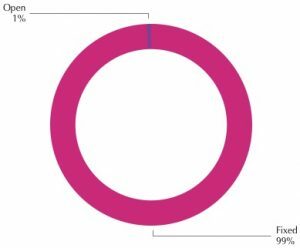 I don’t really like managing purely by numbers (the way a really large project might have to), but it’s good to see that our gut feeling that the game is solid is also backed by data. I don’t know if this is a dark secret of game developers, but games ship with bugs. Known bugs. Part of the late development process is reviewing the bug list to see what most needs fixing. We all hate bugs, but we also love shipping. Not everything has to be fixed before release. The closer we get to making the release build, the stricter the criteria become. We’ve recently deferred a bunch of bugs that we would have fixed when we started the triage process. Why be so strict? Because many fixes can have unintended consequences. We just discovered a fairly rare bug yesterday, which had been introduced by a change we made last year (which was tested back then and found to work perfectly as designed). Since even a simple bug fix can destabilize the game, we want to make sure any last minute fixes are truly warranted. At the end of the process, the only bugs to be fixed are those that affect all players, prevent play, or make us look stupid. Most of what we’ve been finding lately have been issues that come up if you have tons of feuds, or when you made certain decisions and then ally a particular clan. These aren’t going to be that common. And even the players who end up doing that won’t be blocked from the game, or find it illogical. My classic “look stupid” bug was a game I saw years ago, where the publisher spelled their own name wrong on the title screen. Luckily we haven’t found anything like that. But of course, we do want to fix all the bugs. So I’ve been making the fixes in an alternate branch of the code. As soon as everything is locked down in the App Store, we’ll switch over internally and start testing that. Six Ages: Ride Like the Wind comes to the iOS App Store on 28 June, with preorders starting 21 June. It will sell for US$ 9.99. We’re currently developing the game for other platforms, and expect to release them next year. To get a taste of the game, you can watch our launch trailer. Although we have a build approved for the App Store, we’re still fixing bugs and making small changes. There’s not much time left before launch, so we’re trying to triage issues to make sure they aren’t likely to break anything unexpectedly, and that QA will be able to verify that the change actually works. We’re also still busy revamping our web site and marketing. Our plan is that Ride Like the Wind is the first in a series of six related games. You’ll be able to play them in any order, but the idea is that you can continue the story of a clan through the ages. The designers of King of Dragon Pass, David Dunham and Robin D. Laws, have refined the classic game. Compared to King of Dragon Pass, play is both simpler and richer. You’ll get to make more decisions in combat, and can appease an assortment of spirits as well as build shrines to your gods. You’ll explore an unknown land about four times as large, and can choose a special action to perform each year. Food production is less complex. Of course, you will still have advisors with unique personalities, and will follow their stories over multiple generations. Your cows will show your prestige. And you’ll be able to visit the land of the gods. We’re working hard to do the last final polish, so you’ll be able to enjoy the game at the end of the month! I was going through some playtester comments, one of which noted that diplomacy-related magic wasn’t as useful as it might be. So I did a quick review of the four blessings that seemed like they would relate to diplomacy. And while I’m not sure I was looking for exactly what was reported, it did seem like they could be more important. (which another blessing needed) because it affects the entire script, rather than just a specific branch. The game makes extensive use of tags. The scene compiler uses a few to make sure scripts with very particular conditions are triggered from a single spot. Unit testing uses ten tags so it can set up the right context for running scripts. The UI code checks for tags that determine that a scene needs special elements like a text field. And there are over 100 tags that help categorize scripts, including whether magic applies to them. One of my goals was to make sure the game had a better tutorial than King of Dragon Pass. Its tutorial was fairly brittle — it was too easy to get off track. We came up with a different approach, which worked fairly well for explaining all the parts of the game. When you first visit the Relations screen, you get a note explaining it (and to avoid a giant info dump, get more information the next time). There are no exact steps to follow, so the tutorial can’t get confused. And you can learn about a dialog when you get to it, instead of trying to learn everything in a short period. Our playtesters all seemed to like how it worked. But our playtesters tended to be self-selected as having played King of Dragon Pass. When I added another QA tester who had not played before, and had a friend try out the game, it became apparent that the reactive approach didn’t work well for new players. But nothing really helped brand new players get oriented to the game. So I came up with a new design. Rather than try to show you everything (like the King of Dragon Pass tutorial or the Guides), it tries to explain a few topics (particularly things that might be a bit different from other games). It’s even more directed, so you can’t accidentally do the wrong thing. And it hides information, so it’s less distracting. The Tutorial doesn’t go through an entire year, and you can’t continue the game. Its purpose is to give you enough understanding so that when you do begin a real game, things make more sense. And do so interactively, so you can learn by doing. The context-sensitive Guides are still there, since they cover things the Tutorial doesn’t. And there’s still a quick introduction and a detailed manual. Right now we’re testing the new Tutorial, but it seems promising so far. As the game gets closer to release, it’s time to start dividing my time between marketing as well as development. So much has changed since the last time I did that with a new game (it was 1999), but one obvious difference is that games have trailers. This is a “teaser trailer,” which to me means there are no spoilers about the story. That was a pretty big constraint on selecting art and game play, but I think I managed to get a good selection of artwork in. My design phase also tried to embrace the fact that the game is very different from the typical game on the market. So the trailer needed to stand out a little, while still being a decent video. This meant no gratuitous animation (lots of trailers these days seem to add animation to static images) and avoiding the portentous announcer voice many trailers have. Rather than get good at video editing, I found someone who could do that. One thing I did have to figure out was how to actually distribute the video. “Upload to YouTube” isn’t necessarily as simple as saying it, and YouTube has changed things so that it’s hard to annotate the video with clickable links. (That’s why it helps to subscribe to our YouTube channel, which will let us level up and enable that.) My impression is that YouTube is not at all oriented to game developers (as opposed to game players who want to share their play sessions). As usual, the product went through several refinements, including QA noticing artifacts in the voiceover track. It’s nice to be able to show a little more of the game, and it’s going to make it easier to work on the next videos. P.S. No, we have not announced a release date. At last, we’re at beta! In some ways this is just an arbitrary milestone. “Beta” is a pretty loosely defined term, indicating a point in the software development cycle when we think the game is close to the final product, but still has bugs. We don’t expect a lot of design changes, but things are’t locked down. In fact, I made a change to the main menu screen the day after declaring beta. But the main focus now is getting the game shipped. That has two main components: finding bugs, and marketing. Our QA team is still testing (especially since one of the last features added was a new scene), and we’re expanding outside testing to more playtesters (we still have a backlog, but let us know if you’d like to be added to it). I’ve also been running some automated tests, but they can take almost half an hour, so that’s not routine. The other aspect is making sure the game is fun, and the right level of challenge. There’s a lot of emergent story that can be tricky. This is another reason we don’t yet have a target date to release the game. But overall things are going well. We’re definitely on the road to a release candidate.